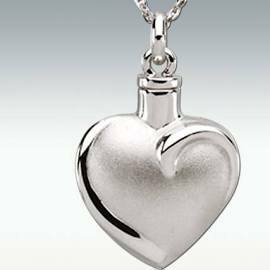 I just ordered one of those heart shaped ash urn lockets where I can put some of Don’s cremated remains and a photo. The sterling silver back will be engraved with his initials, year of his birth and death, and the words “soul mate.” I’d been looking at the Jewelry Keepsakes catalog online for a week now, trying to talk myself into waiting until things aren’t so fresh and sentimental thoughts didn’t over rule common sense. My cash flow will be better a few months and the interment of Don’s ashes won't take place at the grave site until spring so what’s the hurry, I told myself. But did I listen to my inner voice? Heck no! I can be as stubborn and she can. Ya, as hard as it is to admit, sometimes my inner voice is smarter than I am. But she won’t shut the heck up! I won the argument about the locket. Now she’s campaigning to hold back a whole baggie’s worth of Don’s ashes to take to Lake Michigan next summer. Don wanted the grave internment but my inner voice wants us both to also become part of the landscape---the water lapping on the shore, the wind that come off the lake and bounces around the sand dunes. My mom’s ashes were mixed with thousands of wildflower seeds and spread along a mile-long country path she loved to walk and I’ve never regretted that. It gives me peace to see the flowers that still bloom there, twenty years later. NOTE added April14th. I found the little blue bowl containing my mom's ashes! I was looking for something else altogether and I found it in a box of keepsakes from my childhood that I got out to show my brother. When I pulled the little bowl out, he said he hadn't seen me that happy in along time. Back when I moved I must have put it in the box for safe keeping. It was safe alright...and lost for nearly twelve years! Beautiful piece of jewelry. I have thought about doing something like this also, but won't get Mike's ashes until sometime in 2013, and not sure how I will feel then. Mike wanted his ashes spread on a lake he spent his teen years around. Seems silly to me, because he and I didn't spend time there, but that's what he wanted, so I suppose that's what I will do, but as Scarlet said, I'll think about that tomorrow. The nicest part about having ashes is you do have the option of dividing them up a little or a lot. A friend pointed that out to me when I was lamenting having to bury Don's. I have similar feelings as your husband. I spent all of my childhood summers on a lake and I'd like part of my ashes spread on that lake. There is something about the memories formed in the innocence of youth that keep drawing me back to that place. In our tradition we always spread ashes into river. I spread our daughter's ashes in river ganges(one of the holiest river of India). never thought so beautifully about it, we did it because it was one of the rituals, but love your reasoning. Hi Asha, The idea of being part of nature when we die isn't an original idea. I think I borrowed it from one of the religions in your part of the world. I'm sorry to hear about your daughter. As much as we "talked" back when I was in the stroke support world I don't remember that ever coming up. After my mother died on the other side of the world, my sister came to visit us and brought me some of my mother's ashes. I keep them in a lovely little silver purse given to me when I worked in a part of south-east Asia where silver ornaments were worn on special occasions. My mother had a wonderful year staying here with us just a few years before she died, and that little silver purse in my living-room makes me feel she is still a part of our life. Yes, grief is strange but I agree: human resilience is ultimately stronger - or can be, if we let it. When my husband lost a teenage son from an earlier marriage, it was at the boy's funeral that we decided the time had come to commit ourselves to each other. Until At that time, we'd been going together for more than a year but holding back from serious commitment. So we held a big party a few weeks after the funeral to celebrate Andy's life and our decision. That was 33 years ago. What my husband found hardest after that were the first days when he realised he hadn't thought about his loss all day. It made him feel he'd betrayed his son. But of course, it meant he was choosing life over death - or so I think. I love what you said about our husband's remains being part of God's best work. What is it about water, or meadows? A few months after my fellow died, I drove up the coast of Maine in our RV, then paddled out in a canoe to cast his ashes over our favorite waters. The first time, just a few months after his death, his son and I went out. It felt somber. The second time, a year later with his daughter, I felt so lighthearted, I began laughing, which was a little embarassing. I haven't yet read whether you took a baggie of Don's ashes to Lake Michigan. Will read on. In the movie, A River Runs Through it, they talk about water being from the bottom of time. And when you think about it, it will be here as long as man walks the earth---it's so essential to our existence. For me, having my husband being part of that is comforting.